Here’s another case of melodrama but this one, I really liked. The final installment of Endless Love series, Spring Waltz has it’s funny aspects but the whole mood of the drama is mainly romance and inner angst. I would have to warn you that the first 8 episodes of the drama was dedicated for the past of the two main characters. So you will see a couple of children playing around getting to know each other despite their poverty stricken condition and then... it sort of drags on. Lee Su Ho, whose father was debt stricken and was left in the care of Su Eun Young’s mother thus making them live in the same house. Su Ho is a good kid and really cared for Eun Young while she, on the other hand adored Su Ho as well. Eun Young is a very talented but sickly girl. Her mother was actually working hard so she could get Eun Young an operation, but due to Su Ho’s father stealing that hard earned money, this drove the two kids apart. Years past and they cross paths once again but now in different names. As for why that happened? Watch the drama. *grins* This is also the part where the story picks up it's pace. What are the things I loved about Spring Waltz? The story line is already given, so what else? It’s the back drop setting, the mood and the OST. The main characters are raw actors and they aren’t really that good in acting yet but… given the setting where SPRING color is all around, everything becomes an eye candy. The colorful hues of everything within the drama says SPRING SPRING SPRING! The luscious color of green, purple, blue, pink and everything else in between is accentuated. I couldn’t help but smile while watching it all. It was really great to look at. Then comes in the OST, it was more on the musical scoring but hearing Loveholic sing One Love was a plus point. 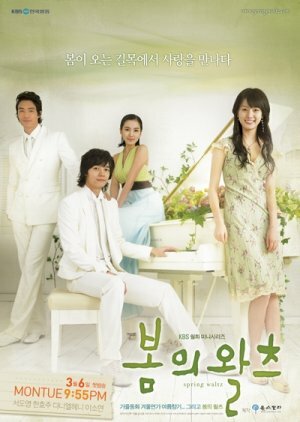 Whenever I hear that song, I am reminded of how much I loved this drama.